“Siren Song.” Katherine Westphal, American, (1919-2018). 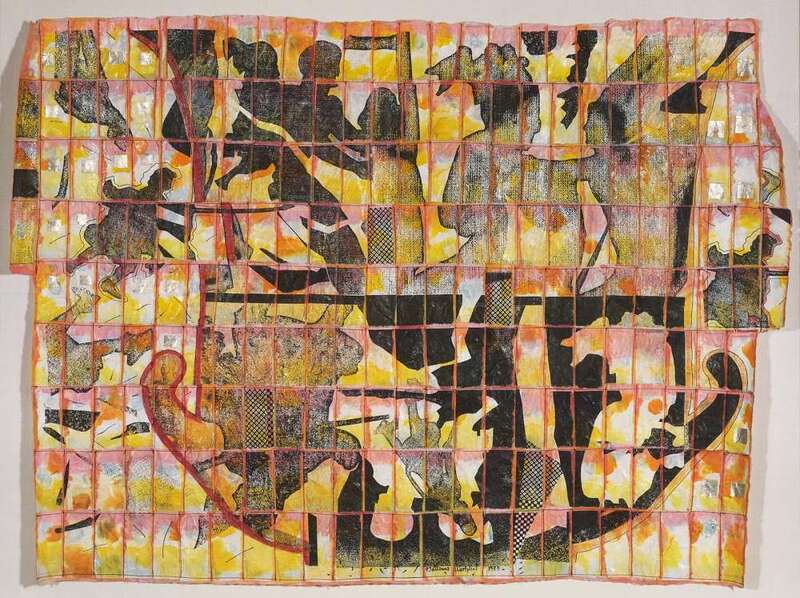 Paper; machine-stitched patchwork, photocopy heat-transfer, dye-transfer crayon. The Daphne Farago Collection (2004.2159). Photograph © Museum of Fine Arts, Boston. 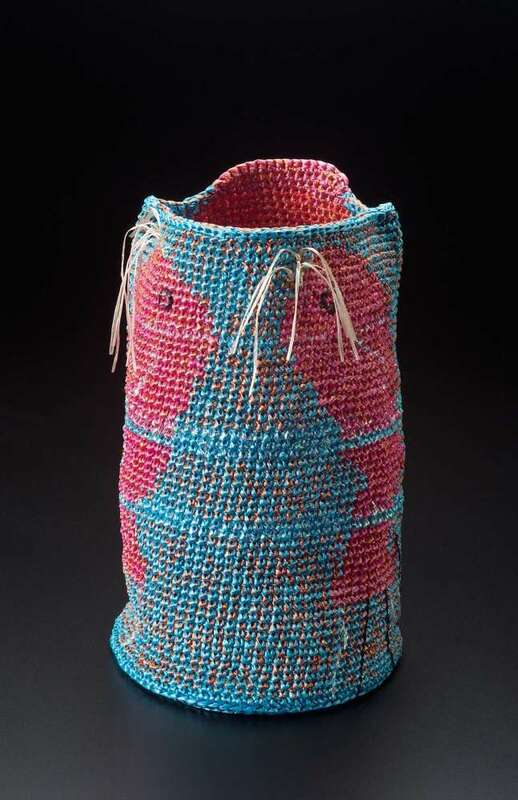 I depart momentarily from my focus on ancient Peruvian textiles to honor the life and work of pioneering multi-media fiber artist Katherine Westphal who died last week at the age of 99. 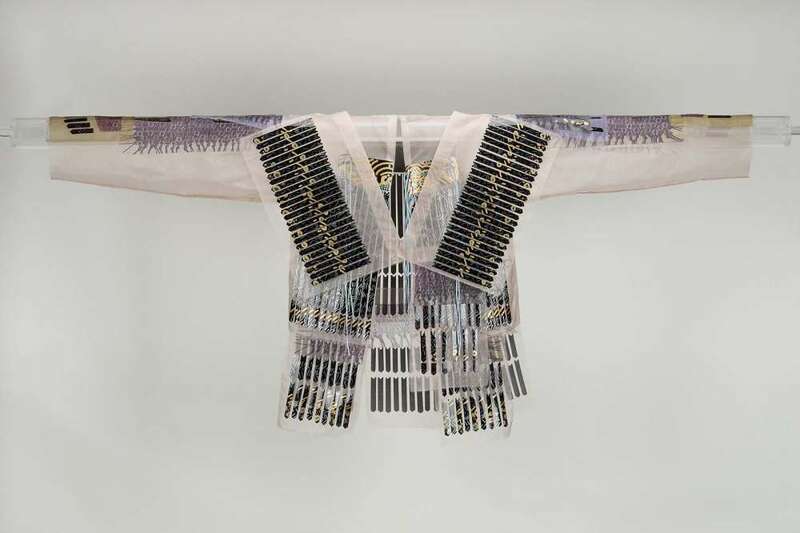 She was a seminal maker in multiple mediums who practiced rigorous experimentation and pushing of boundaries in textile traditions and encouraged this through her teaching. 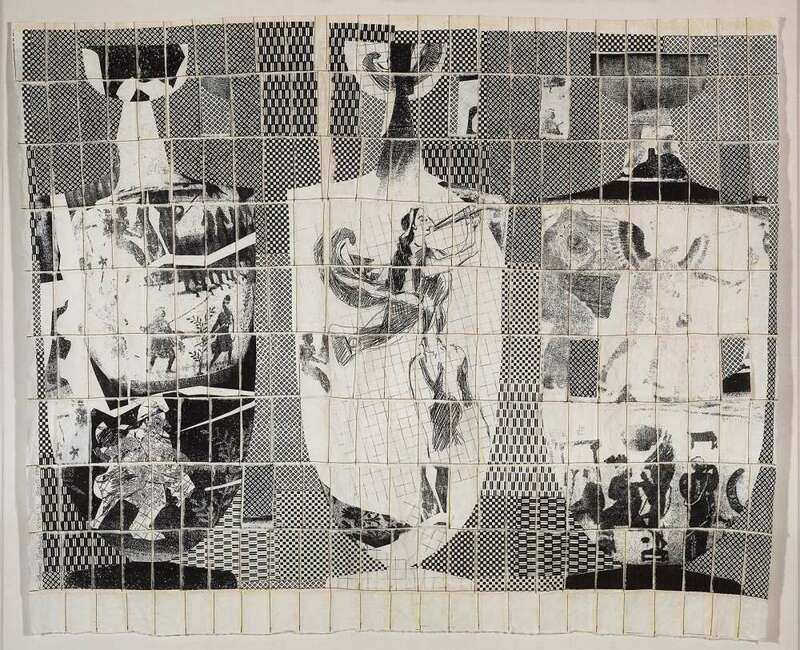 Westphal employed time-honored textile techniques: sewing, resist dyeing and tapestry weaving, in combination with the emergent processes of her time that came with the Xerox photocopier and other unconventional materials like plastic tubing and tape, to deconstruct and recast new textile forms. She challenged stereotypic views of “women’s work” and brought recognition to quilt making as a fine art form. 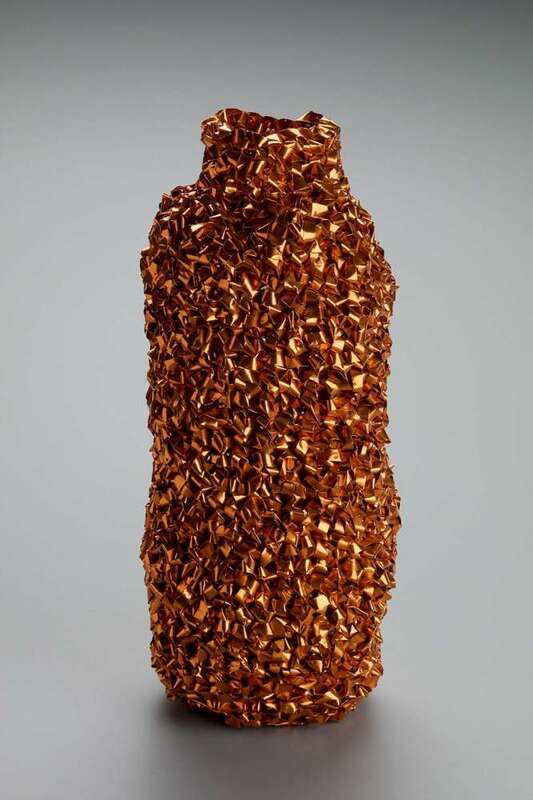 The Museum of Fine Arts, Boston houses an impressive collection of work by Katherine Westphal. Though my weekly posts normally focus on singular objects, I’ve include several of my favorite images here of the artist’s work. Scroll to the end of this page for a link to the MFA’s complete collection of the Westphal’s work, and for related links about her life and career. “Heavenly Fish,” 1993. Katherine Westphal (American, 1919-2018). Synthetic raffia; crocheted. The Daphne Farago Collection (2004.2148). Photograph © Museum of Fine Arts, Boston. “Rossweisse,” 1974. Katherine Westphal (American, 1919-2018). Foil; crocheted. The Daphne Farago Collection (2004.2142). Photograph © Museum of Fine Arts, Boston. “Swimmers,” 1993. Katherine Westphal (American, 1919-2018). Raffia, synthetic raffia; crocheted. The Daphne Farago Collection (2004.2166). Photograph © Museum of Fine Arts, Boston. My baskets build one stitch at a time – color, shape, image, idea – in a spiral pattern, a growth form. 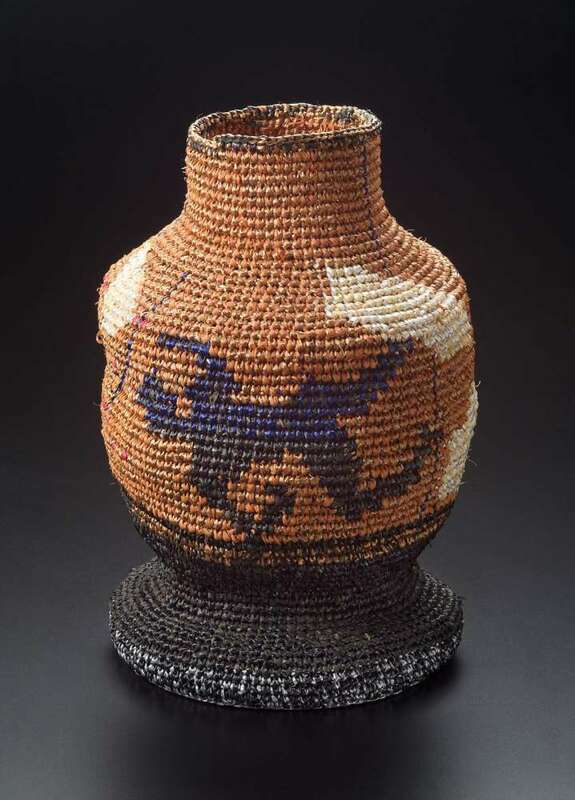 Each basket has a name – and an identity, and each basket is part of a series. The ideas can stem from nature, art, or from the chance remark of a friend. My baskets are not narrative or representational; they are my emotional reaction to a place, event or object. “Tiananmen Square, June 1989”. Katherine Westphal (American, 1919-2018). 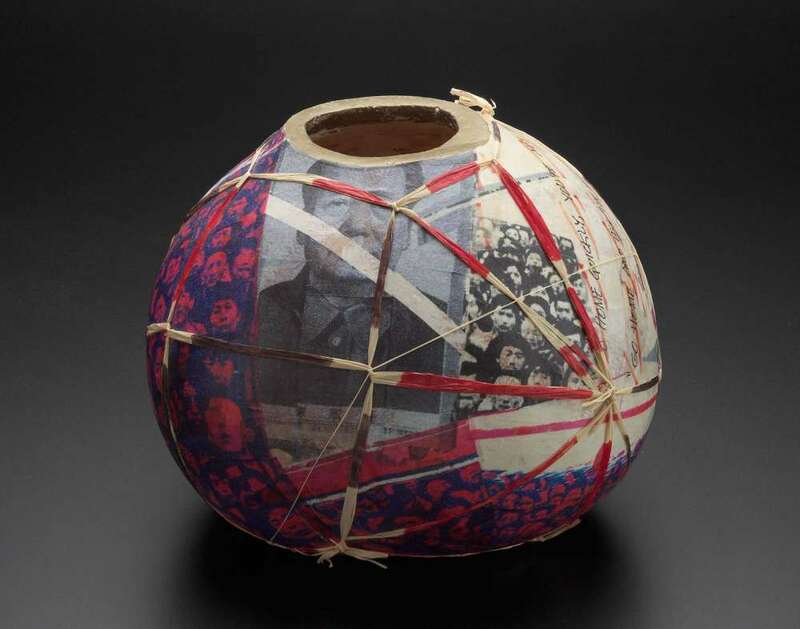 Gourd covered with photocopy-heat-transfer-printed paper, tied with straw. The Daphne Farago Collection (2004.2155). Photograph © Museum of Fine Arts, Boston. “Out of Focus in Attica,” 1993. Katherine Westphal (American, 1919-2018). Paper; machine-stitched patchwork, dip-dyed, photocopy heat-transfer, crayon and felt-tipped-pen drawing. The Daphne Farago Collection (2004.2163). Photograph © Museum of Fine Arts, Boston. Black Samurai, 1977. Katherine Westphal (American, 1919-2018). Commercial silk organza, self-stick plastic tape, silk cord; color photography heat-transfer and felt-tip pen drawing. The Daphne Farago Collection (2004.2092). Photograph © Museum of Fine Arts, Boston.